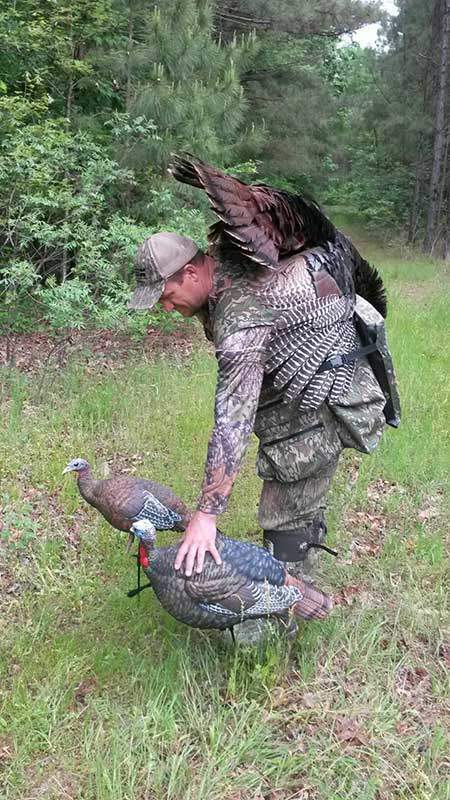 If you have turkey hunted for any length of time, you know that some days, they simply don’t gobble. The same long beard that gobbled 50 times on the limb and 50 times on the ground yesterday has seemingly gone mute. This is when a lot of hunters head to the local café for breakfast or back to camp for a nap. When turkeys go silent it can be from hunting pressure, predators or any number of things. I know if I can stick it out and get in his back yard, I have a great chance of killing a bird that day. The turkeys are still there, and still want to breed hens. I use 2 basic approaches for smashing a big ol tight lipped tom. Get Moving. If I didn’t hear a bird on the limb, or maybe only heard a few distant gobbles. I will put my boots on the ground and try to strike up a bird. I will always try a gobble tube early in the morning to see if I can get a dominant bird to gobble back. Now, if I can get him to gobble once, I feel like I it is a very killable bird. Don’t think he will keep gobbling every time you call. If the gobble tube doesn’t strike a bird, try a shock gobble call of some sort. I try to stay away from the owl and crow calls as much as possible on public property. I will instead reach for a goose call or a wood duck squealer. These calls sound great and are natural for my area. Now, if these techniques don’t work, I will reach for my Zink Aluminum pot call and get down on it hard. I will make very loud and aggressive cuts to excite a tom into gobbling. After I have given these a whirl in several areas with no response, I go to plan B.
Strut Zones. If I can’t get a bird to gobble, I know they will still want to strut for all the single ladies in the area. What is a strut zone you say? You should’ve already done your homework to find a field, high line, gas line or food plot that the gobblers really like to strut in. I will get in an area like this and set up an Avian X full strut decoy and an Avian X breeder hen. I will call at a normal volume and cadence, nothing too crazy. I will call about every 10-15 minutes, either with a Zink Matt Morrett mouth call, or Zink Power Hen slate call. Keep your eyes and ears peeled when you are hunting like this. Most of the time these birds will come in silent, but will still fan out and put on a show when they do show up. How long do you sit there? That is a million dollar question. If it is a spot I have a lot of confidence in, I may sit for several hours. But I will always give an area 1 hour at least. I would quit turkey hunting tomorrow if they didn’t gobble or strut anymore. That is what draws me to the spring woods like a june bug to a light. The sound of a deep drawn out gobble in the woods at daybreak is what I live for every spring. More times than not these birds that slip in silent are 3 or 4 year old birds with those coveted limb hangers. But, when they ain’t gobblin’, I will take the fight to them. I am not always successful when the birds don’t gobble, but I have 0% chance of killing him at the café or the house.